We love Phineas and Ferb around here. A lot. 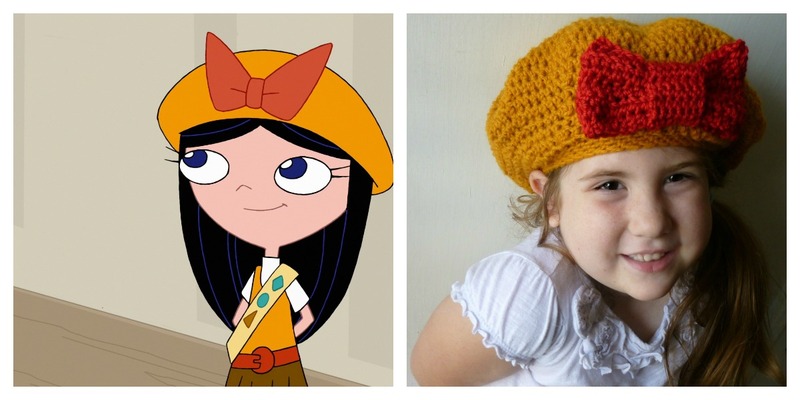 Mims likes to pretend that she's Isabella, so I decided to make her an Isabella-in-her-Fireside-Girl-uniform costume. I don't know if this is going to be her Halloween costume, but it's fun for playing dress up, and it's cute to wear out in public. People who know will recognize her, and those that don't will just think she's adorable. Either way it's a win for this mom. 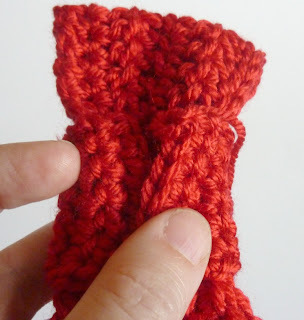 Grab your yarn needle and use the tail end of the big loop piece to stitch the short sides together into a loop. Weave in any leftover ends. 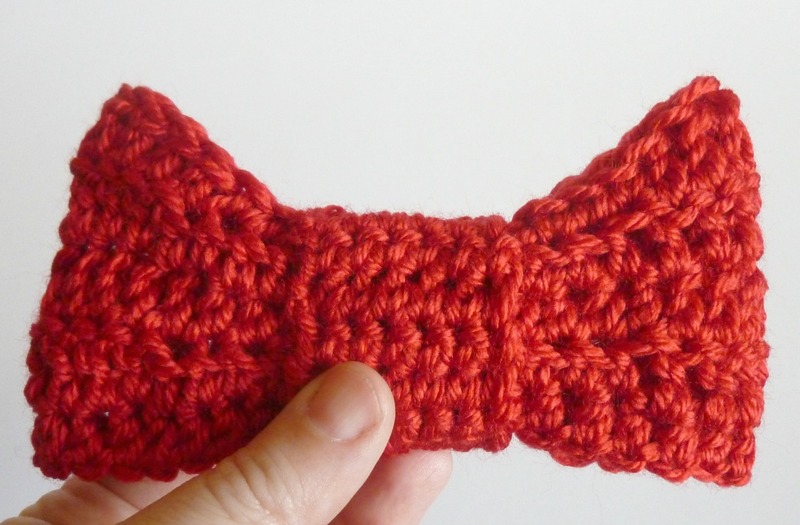 Wrap the center piece around the center of the loop piece to make a bow. 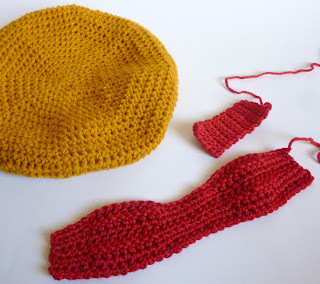 Using the leftover yarn tail from the center piece, sew the center short ends together. 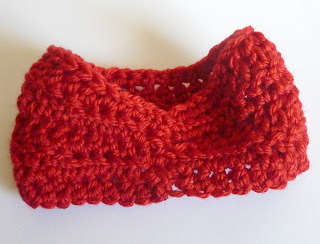 Tug the top corners of your bow up to make them nice and pointy, just like Isabella's bow! Now you're ready to stitch it to the front of the beret. Mims loves being my model, but she get's a little squirrely sometimes. Yes!! 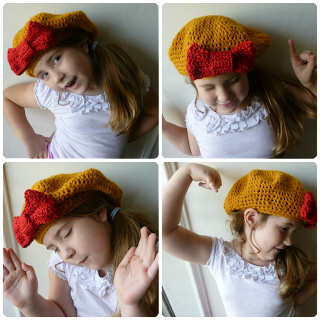 Kaleigh, go to my free patterns list and use the pattern I put up last month for the Dynamite Beret which would be just the right size. Swap out the last 2 rows (R26-27) for 3 rows of single crochet (56 stitches). Then make the bow and you're set! This puts a smile on my face. 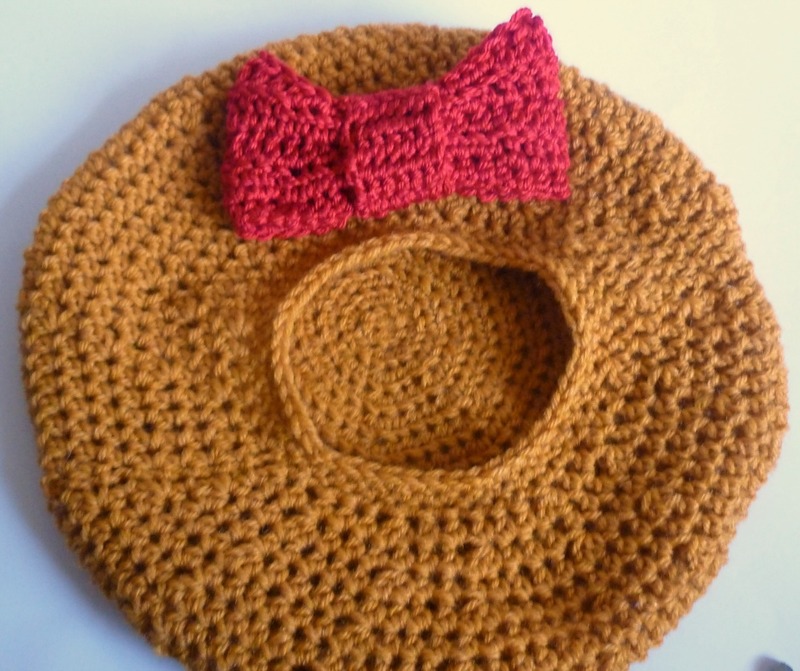 I love the bow, I might make one to put on a headband. It would be super cute on a headband. That's a really good idea! Mims would love that too! I was excited because I was hoping that this might work for what you wanted too! Two birds! Yippee! I love it when things work out like that. This is too awesome, Mim's is really rockin this look, she is absolutely adoreable. This is super cute. I think it would make amazing Christmas gifts. I'm so happy you got a new keyboard... I miss you! This almost (almost) makes me wish I had a 5-year-old daughter to make one for, that's how danged cute it is! OMGOSH! I know what I'm gonna be next year for Halloween!!!!!!!! I would love you forever if you wanted to do that. I am a little intimidated and overwhelmed by Ravelry, so anything that you want to put up is amazing. I never will turn down your offers to help me!!! OK! I did it -- take a look and let me know what you think when you get a chance..... I didn't know how you might feel about putting pics of M up, so I just put the beret-only pic up. And I'm hoping that you as the designated designer can edit the pattern page, add/change pics if you want, change the wording, whatever, if there's anything you want to change, I hope you can (it would be dumb if it was now set-in-stone and you couldn't change it). Thank you SOOOOO MUCH! I really, really appreciate this! You're the best! 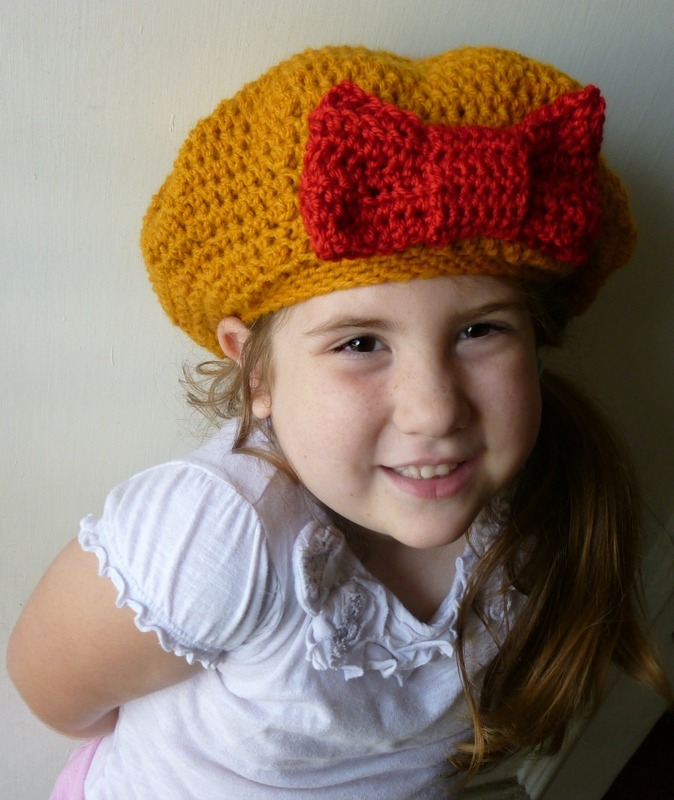 Thanks so much for this pattern!!! It was just what I was looking for. It's super easy, relatively quick plus... Phineas and Ferb! The bow looks so much more put together than other bow patterns I've seen out there. Thanks again!! !